Hardfork 14 went well, upgraded all the nodes I control, updates to the sites I run, and finished my last full week of 40hr/week contract work. Feels like a pretty accomplished week! I also finished setting up my control center for my witness operations, which you can see below. 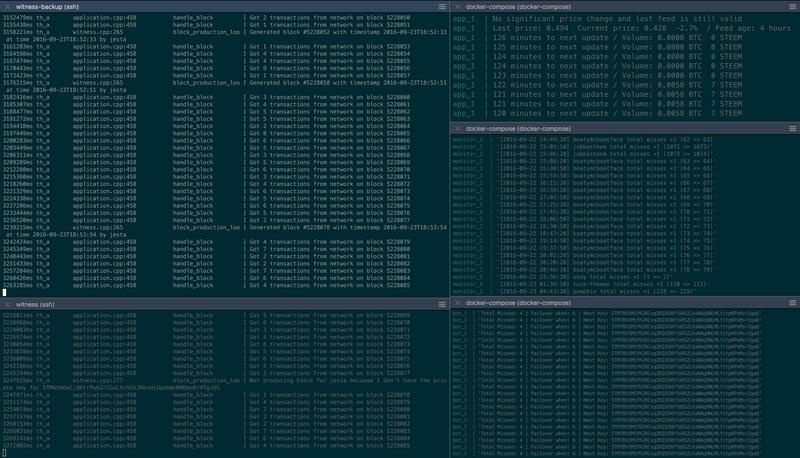 The left side is both of my witness nodes, the right side contains my price feed, a script to watch every missed block as it happens, and my failover script to swap between witnesses in case of an outage. I can finally sleep a little easier knowing that if one of my witness nodes goes down, the other will come online automatically. Implemented and announced a update to steemdb.com, including updates for 0.14.2, new features, and new APIs that are being used in a number of projects by other people. Created a how-to guide for securing your funds using the new savings feature. Participated in hardfork 14 and the upgrade to 0.14.2, upgrading both of my witness nodes. Upgraded the NA region of node.steem.ws to 0.14.2. Upgraded steemstats.com to support new operation types in 0.14.2. Finally finished setting up automatic failovers for my witness node (thanks to @furion for getting update_witness working in piston!). The script also sends me an SMS message upon failure so I know I need to investigate what's going on. Setup #witness-blocks in steemit.chat which reports all missed blocks by all witnesses. Adjusted my price feed to offset and assist in maintaining the SBD peg (as suggested by @dantheman earlier in the week). Spent Sunday/Monday further developing/discussing future business plans within the steem ecosystem. Finished my last full week of contract work! Freeeeeedom! I'm planning on actually taking a bit of time off over the next week. I really haven't taken a day/night off in the last few months. This week I think it'll be a bit lighter for me, unless something happens that requires my attention. I'm also a bit under the weather, so I feel it'll be a wise decision to do so. October/November are shaping up to be 100% dedicated to steem related projects - excited to get some announcements out for what's to come. I want to write a post about potential additional benefits of holding steem power. I've been gathering/brainstorming notes for weeks on how to make powering up more appealing, it's almost to a point where I have enough meat to write an article. I just recently started recording custom_json operations on steemdb. I'd like to surface that information on steemdb in the near future. Hopefully it'll lead to seeing who followed who, and when. Continue learning how reactjs works in evaluation for a potential steemstats revamp. I'm on the search for a good asia/pacific region dedicated server (~32gb RAM) for a decent price. Also on the lookout for one in the EU region (screw heitzner and their verification lol). If anyone's got recommendations, I have a few more nodes I'd like to setup. There's been a lot of division in the community over the past couple weeks, specifically over voting patterns and content creation. I don't think that any of this is actually healthy for the growth of the platform and I question whether we should be supporting these efforts. Right now there are two groups at odds, neither of which I fall into. We have a group of smaller accounts complaining about what content is getting voted upon, and we have a small group of larger accounts who are being targeted based on their activity. People are digging into each other and essentially attacking the actions of others, accusing people of things based on subjective opinions and limited knowledge. I'd like to see this stop, it's not helping. Right now we are all playing by the same rules in the same game. Anyone can create small accounts, create content, and any account can become a whale with proper investment. In fighting between these groups solves nothing, and I'd encourage everyone participating in this activity to stop attacking each other and start looking for ways the system could be changed for the better.